You’ve got the technical abilities. But are you ready for the formal, non-technical interview to land your next developer role? Now more than ever, businesses want programmers who can do more than crack code. They want professionals who deliver seamless products efficiently and timely. To prove that you’re a well-rounded developer and trusted business partner, be ready to answer these soft IT interview questions below to pass your next vetting process with flying colors. Software developers must be ready to showcase their portfolio during the interview. Interviewers examine past performance and achievements to gauge how a candidate will perform in the future if hired. Be sure to provide links to your past work via Behance, Dribble, GitHub, Stack Overflow, Apple App Store, Google Play Store and more. Also, be prepared to explain your role in projects you’ve contributed to and how you arrived at the end product. If you’re an entry-level software engineer with no professional portfolio, showcase solid, completed projects you have built yourself. School and passion projects are always welcomed. Interviewers use this question to learn what a candidate is looking for in an employer and to identify potential red flags. Often, interviewers misinterpret short job stints and contract work as red flags. However, in this gig economy, there’s an undeniable presence of job hopping, especially among the millennial workforce. If you find yourself in this boat, it’s okay. Be prepared to articulate why you’ve chosen this type of work and how it has broadened your skill set. Turn this misinterpreted negative into a positive and have it work to your advantage. When organizations and programmers collaborate, better products get built. In this new era of product development, developers, designers and stakeholders work together to ensure projects are completed on time and successfully. In response to a question like this, it’s critical to express your work process and how you embrace a collaborative approach that includes open channels of communication and regular stakeholder meetings to provide status updates and reviews. Discuss your preferred project management tools, processes and communications methods to show your interviewer that you are an effective communicator and partner. 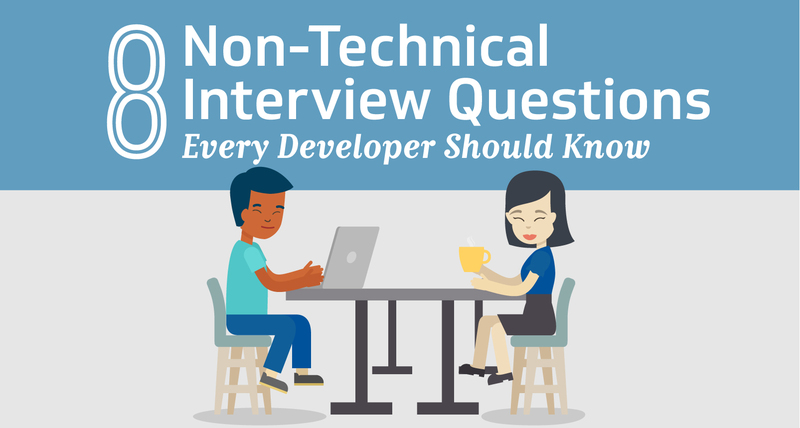 You may be thinking, ‘I thought this article was about NON-technical interview questions,’ but we can’t exclude this important question. Your knowledge will always be a topic of discussion during an interview. Often, employers are searching for candidates who have T-shaped skills: expertise in at least one area and the ability to collaborate across other disciplines. This skill set enables organizations to minimize dependencies and reduce knowledge silos. When speaking to your T-shaped skill set, identify your top skills and those that compliment it. For example, if you specialize in front-end development, discuss your additional knowledge of UI, UX and web design, and how this allows you to predict requirements ahead of time. When crafting an answer for this IT interview question, use past examples and leverage work with similar companies to show prospective employers that you can align with their initiatives. Be sure to also research a company before you interview, including their platforms. Are there notable things that you can improve immediately? Are there product issues they’re unaware of? Leveraging your knowledge of a business and highlighting what you can offer will only prove to a prospective employer that you are invested in a role by doing your homework prior to the interview. Software engineers typically work with QA, whether it’s a team or a process they have to conduct themselves. As a developer, you will need to explain how you manage quality control. Do you perform tests to discover bugs? How do you practice code-reviews? Quality assurance is critical for the successful release of any project. No one wants to hire a candidate that may be at odds with their QA. Be sure to effectively explain during your interview that you value QA and how you handle the process. Pay is an uncomfortable topic that often comes up during an interview. To avoid floundering during this question and being caught off guard, prepare your answer ahead of time to articulate your wants. Do you offer an upfront, one-time fee? A deposit? Do you have a minimum salary? Show your professionalism by being transparent about your service model or your salary needs. If this process is too daunting, enlist a trusted recruiter to navigate salary talks for you. Recruiters have extensive experience in salary negotiations, and they’re experts at finding the salary that you deserve. All too often, companies end up hiring the wrong developer for a project, leading to delays, wasted time and money. Set yourself apart from the competition by selling more than your technical abilities. (Your portfolio should speak to that.) Show your accountability, communication skills and your understanding of customers’ needs by describing previous experiences. “Most companies are hyper-aware of how a candidate will affect the culture of a team, whether it be work ethic or demeanor. Culture and soft skills can sometimes trump the technical match when clients choose which candidate to hire,” Malara said. These traits and past behaviors determine what kind of partner you will be. Remember it’s up to you to persuade interviewers to invest in you. Anticipate these non-technical questions to waltz through your next interview like a pro!